One from the archives ... I wrote this in August 2009, lost it, and found it again this morning. I very much enjoy reading the weekly Economist news-magazine - every issue invariably contains at least a few very interesting and informative articles on finance or politics, less dumbed down than any of the local media choices I enjoy living in The Land of the Free (Though Uninformed). Every year I try to get away for a couple of weeks to my family's vacation property, a tiny log cabin on a remote lake in British Columbia, Canada. 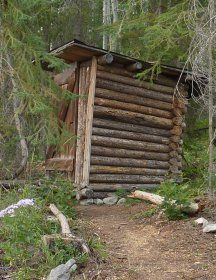 It is completely rustic - the nearest cell tower is some 30 miles away, nearest utility of any kind is 10 miles away, running water happens when the guy with the bucket is wearing sneakers, and those who like to think of their country as the "Home of the Brave" have never braved our outhouse. It was therefore with interest and a certain bemusement that I, sitting on my throne in the woods, was reading "Face value - Flush with ambition" - Economist, July 25 2009, page 66 - about the Neorest, a high-tech Japanese toilet from Toto, which "... hides odours and plays sounds like running water or birdsong to drown out embarrassing noises," for a mere $5000. And I got to thinking: if Toto, an industrial powerhouse in Japan, could get their collective heads out of their, um, homeland long enough to see the opportunity provided by wilderness vacations, what could they offer the remote camping crowd? Birdsong I already have: a flock of loons, whiskey jack, chickadee, woodpecker, and hawk so far this morning. In fact, if the Japanese and Whoopi Goldberg are willing to plonk down $5K for these things, perhaps I can just rent out my facility with real, not artificial, birdsong. Though I'd have a little more trouble with hiding odours and a heated seat. Maybe Toto's engineers could solve those problems together: somehow capture the various gases and run them through a small efficient burner to heat the seat? If they could do that without singeing something important, I'd pay for it.